If you’re a Chrome web browser user, you may find yourself wanting to delete a specific website cookie (or cookies) from the browser. The benefit to removing a site specific cookie is that you don’t have to clear all web data and caches, you can target a specific cookie as needed to remove and clear. This can be very helpful for troubleshooting websites, removing traces of a visit, clearing out stubborn site settings, and many web developers in particular use this technique often. 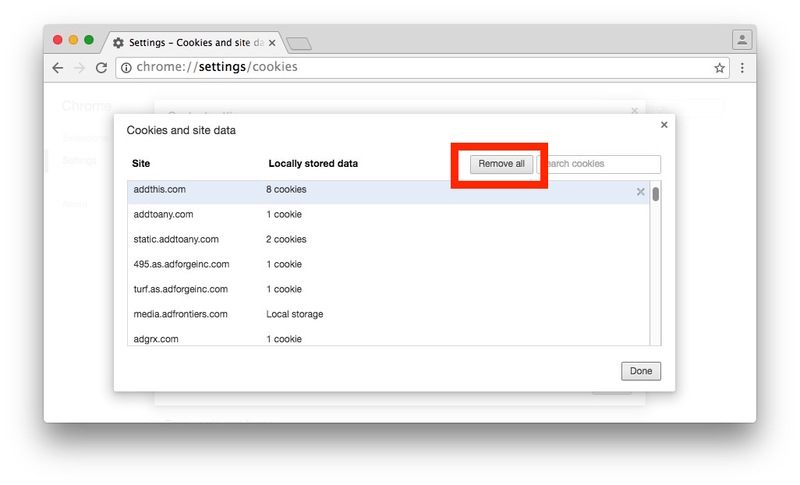 We’re going to show you how to target site specific cookies to delete in Chrome, this is demonstrated in Chrome for Mac OS X but it works the same in other versions of Chrome for Windows and Linux too. You’ll notice that when removing a cookie for a specific site you can also identify which cookies are placed. If you’re removing a specific sites cookie for testing purposes, you’ll likely want to close the existing browser window and open a new one rather than simply refresh the page. Keep in mind you can avoid cookie placement and cache generation in the first place by using the Chrome Incognito Mode private browsing feature. Keep in mind that this is targeting the removal of cookies only, whether on a site specific basis, or whether you’re removing all cookies in Chrome. This does not remove general web data from Chrome, though you can clear cache, web history, and web data from Chrome with this guide if that is desired. This covers the desktop side of things with Chrome for Mac, Windows, Linux, and Chrome OS, but remember you can also remove Chrome cookies and browsing history on iPhone and iPad too if need be. 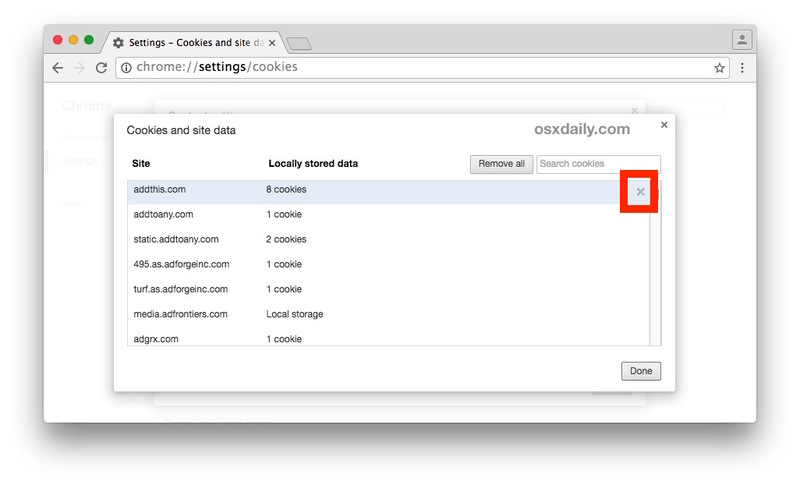 And for those who aren’t Chrome users, you can always clear cookies in Safari for Mac as well. 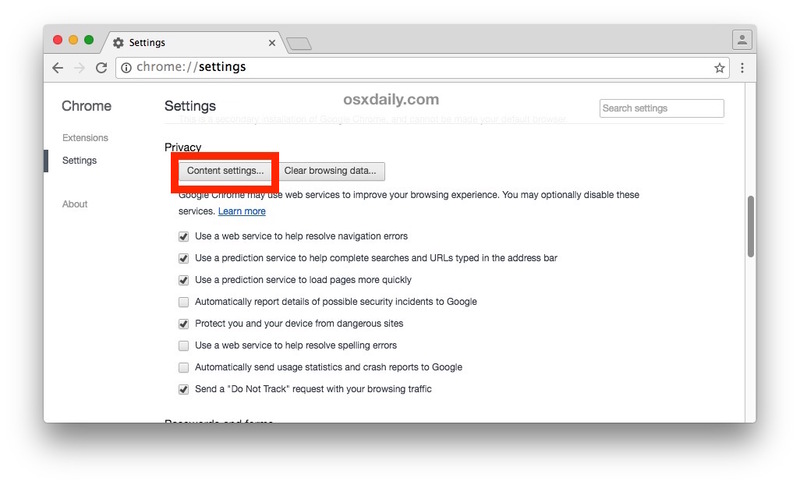 Works similarly in Firefox and Safari. Why the Chrome only instructions? 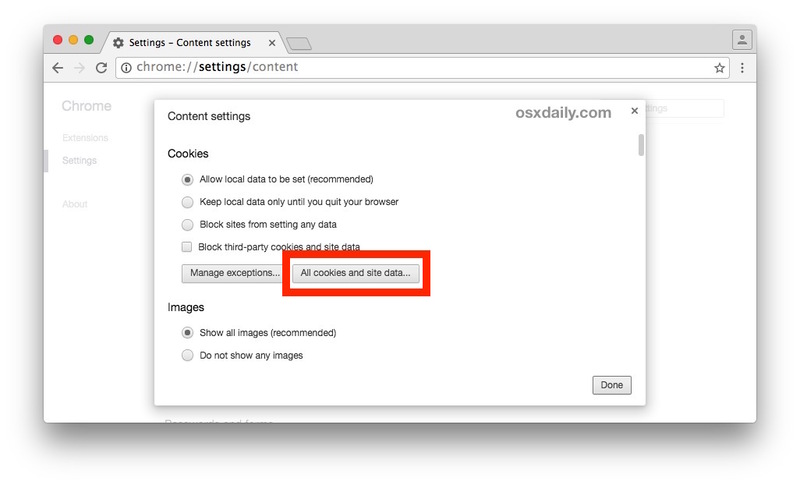 Is there any extension in Safari or Chrome Mac, that automatically blocks site-specific cookie? Not all cookies, but site – specific cookie for a pre configured set of websites? My screen looks nothing like that. There doesn’t appear to be a way to only delete specific cookies, no search box. David, EXACTLY! It’s very annoying that you can’t select multiple cookies (or select all then DEselect the ones you actually want to keep, so you don’t get logged out of mail and social media) then delete all at once. I’d even put up with deleting select ones one at at time IF it didn’t pop you back to the top making you start all over. Very frustrating. I may just have to delete all and re-log back into certain sites. Chrome what the heck. You removed the feature for highlighted/checkboxing multiple individual cookies. Now every damn time I scroll down to remove one, it auto-scrolls all the way to the first cookie on top of the list, then I have to scroll ALL the way down to check the other cookies. There are cookies I have to keep for finances and accounting software. EVERY DAMN UPDATE THESE STUPID COMPANIES DO MAKE THINGS WORSE. The dropdown list menu in Microsoft office was FAR better. The old windows media player that had the left tab come out of the media player box serving as the drop down playlist/song list as well as the tab below the player media box that served as the equalizer was simple and efficient. Every new version of skin was absolute garbage.